Malaria is a serious mosquito borne disease in Uganda and every precaution should be taken against it. Most medical personnel strongly recommends the use of Lariam® (Mefloquine HCl). There are side effects from Lariam and the Internet is full of horror stories about the bad side of Lariam®. However, this is another of the areas where what we hear and read and what twenty-five years of experience has actually shown are far apart. Few people bother to post on the Internet a report that says "I took Lariam® and everything was just fine." I recently read that more people die each year from mosquito borne illness than all other insect and animal afflictions combined with malaria being number one on the list. The January - March 1999 quarterly newsletter of the World Health Organization (WHO) as quoted in the April 8, 1999 New Vision, stated that one of five deaths in Uganda are caused by malaria and accounted for over 80,000 deaths in 1996. You are encouraged to discuss this issue with your physician and visit the CDC Traveler's Health web site. In late 2011, a team from the western US, traveled to Uganda for a ten week mission trip. Someone on the team had read on the Internet that taking anti-malarials can damage your liver. It followed that no one on the team took any preventative medication. All the wonderful things accomplished on this trip were overshadowed at the end when one of their number died in Uganda from malaria. I am not a doctor and have no medical background but I have made over 45 trips to Uganda in 25 years and learning that many Ugandans die from malaria has helped me establish the following five step protocol for teams I lead. If you scroll down this page, additional information on each step can be found. There are three main drugs available. Mefloquine (Lariam® or Mefliam®), Doxycycline (Randociln® or Cyclidox®), and Malarone (Atovaquone Proguanil HCI. Most members of ACTI teams use Lariam® but you need to discuss the issue of malaria prophylaxis with your physician. Doxycycline® is effective against the asexual erytrocytic forms of the malaria agent, Plasmodium falciparum, but not against the gametocytes. 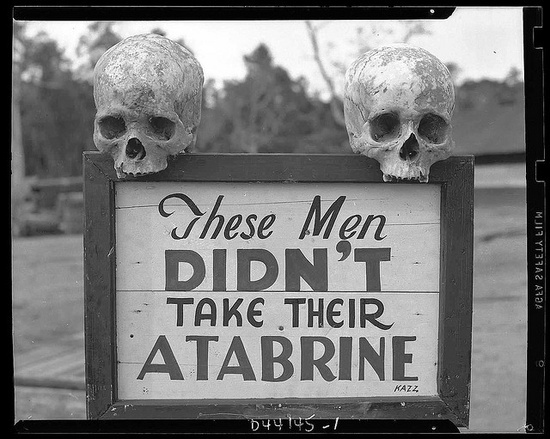 Prophylactic use is recommended when traveling to tropical zones (malarious areas), especially where there are strains resistant to cloroquine and primaquine/sulfadoxine. Prophylactic use: before departure - 2 x 100 mg on the first day, 1 x 100 mg for two days, after meals; during stay - 1 x 100 mg, after meals, with a limit of four months; after departure - 1 x 100 mg, after meals, for four weeks. Malarone® is an antimalarial shown to be effective for both prevention and treatment of malaria caused by P falciparum, the parasite responsible for the majority of deaths due to the disease. Malarone® is a fixed-dose combination of atovaquone and proguanil hydrochloride. Individually atovaquone and proguanil have different mechanisms of action such that when combined, they have a synergistic effect with greater efficacy than either agent alone. Prophylactic treatment with Malarone® should begin 1 to 2 days before entering a malaria endemic area and continued daily during the stay and for 7 days after return. In adults the dose is one tablet (250 mg of atovaquone and 100 mg of proguanil hydrochloride) per day, taken at the same time each day with food or a milky drink. Lariam® (Mephaquin® or Mefloquine®) When you read the posts on the Internet concerning Lariam®, you almost get the idea no one anywhere has given it the slightest thought with respect to adverse reactions and it is sold over the counter like candy. The clinical trials necessary for a drug to be approved by the US FDA are designed and programmed so that it is very unlikely that any numerically significant side-effect or interactions will appear that have not been detected during the trial phases. In reality, this process is a multimillion dollar process that can take up to ten years. Lariam®, is no exception and the side-effects you read about on the Internet are well documented in the Lariam® literature as to their nature and incidence of occurrences. Very few people who have taken Lariam®, without incidence post such on the Internet. It is those with negative reactions that take the time to post to discussion groups. Remember, some people cannot take simple aspirin without a negative reaction, but it works just fine for millions. Preventing malaria is not unimportant. 100,000 people per year die of malaria in Uganda alone. Lariam® (Mephaquin® or Mefloquine®) comes in 250mg oral tablets and one tablet is a dose. The number of tablets you need will depend on the length of time you stay in Uganda. Lariam® is to be taken as follows: One dose one week before departure, one dose on the day of departure and one dose each week while traveling and then one dose per week for three full weeks after you return. Lariam® is also sold under the name Meflotas®, Mephaquin®, and Mefloquine®. Our teams have found the cost of Lariam® in the US to be as high as $12.00 per tablet. Therefore, we only purchase enough tablets the first doses (one week before the scheduled day of arrival)and the first order of business when in Uganda is to purchase additional tablets we need for about $2.00 to $3.00 per tablet depending on which pharmacy you use. To help mitigate the side effects, do not take Lariam on an empty stomach and drink at least one full glass of water with the tablet. Our team members have taken Lariam® for years with no problems except the dreams. As stated above, malaria is very common in Uganda and it appears the potential risks from contracting malaria are far greater than the potential side effects of Lariam®. Again, discuss this with your own doctor. 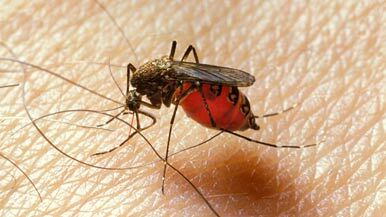 See information on Insect Repellents and Mosquito Netting. The battle against malaria is a never ending one in Uganda. One of the tools at our disposal is insect repellent. The most widely recommended insect repellents are those containing DEET (N,N-diethyl-meta-toluamide) in as high concentration as you can find. 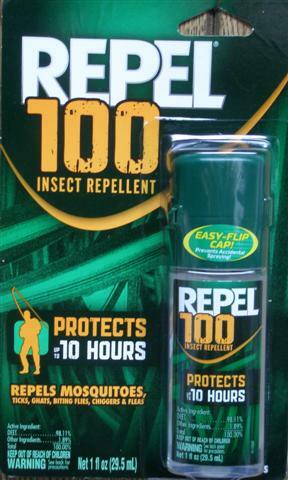 I have found Repel 100 Insect Repellent with 98.11% deet in finger pump dispenser to be idle. I like this product because is has an attached cap that flips open to expose the finger pump. Once closed, it prevents accidental discharge in your pocket, fanny pack or back pack. Normal repellents used to ward off pests at a 4th of July barbecue simply are inadequate in Uganda. But as in many circumstances, there are trade offs. Deet has been shown to be bothersome when misused. One horror story is told about a mother who placed her child in her back yard wearing nothing but a diaper. She then soaked the baby's bare skin from head to toe with highly concentrated deet and there was a predictable negative reaction. To apply deet in such a manner makes no sense at all. The problem is only slightly the deet, but mostly how it was used. In the evening, when the threat of disease carrying mosquitos is greatest, wear long sleeves, long pants or dresses and have your companion spray deet around cuffs and collars, avoiding bare skins whenever possible. We have found this to be both safe and effective. I live on the Florida Gulf Coast where fishing is a way of life. A fisherman friend of mine gave me a "Panama Jack" fishermen's cap that is designed to protect the ears and neck from sunburn. I have worn this hat (see photo) when out at night when mosquitoes were a problem. I generously spray deet on the hat to protect me from mosquito attacks. If you do put deet on your skin, wash it off before going to bed. If deet is applied to children, avoid their hands which can easily be placed in the mouth or eyes. Also avoid applying deet to skin that is injured or contains a rash. Highly concentrated deet will cause the deterioration of some polycarbonates (plastic) so you will want to avoid handling such things as a camera with deet on your hands. Independent laboratory test have found deet to be effective. As stated above, it is available in non-aerosol containers(see note on air travel and aerosol products) Do not break the "safety seal" on such products until you reach Uganda which should be a plus at airport security. Studies show products using citronella, geranium, or other plant oils, provide minimal effectiveness in the battle with malaria. Treating clothing, mosquito netting, etc., with Permethrin provides effective protection by actually killing insects. Permethrin is not absorbed by the skin, but they say you should avoid direct contact with my skin during application. Permethrin is used by the US military to treat clothing for soldiers in jungle conditions. When a mosquito lands on a garment (or net) treated with permethrin, it kills them almost instantly and well before they can do you harm. Again, this just adds one more layer of defense. In a well ventilated area without a draft, spread each item to be sprayed on a flat service so that all the surface area of one side is fully exposed to spraying. Once throughly dry (two to four hours), turn it over and repeat the process. Some items can be hung on a clothes hanger allowing both sides to be treated at once but care should be given to make certain no areas are missed. Do not spray the inside. Read and follow the directions on the container you purchased. Typically you are to hold the container approximately eight inches from the fabric and with a sweeping motion, make sure all surface area is covered. Pack items as you normally would. Treatment is effective for two to four weeks (or as per container instructions) even after normal laundering. Some of our team members have packed the non aerosol bottle in their checked bags and it made it to Uganda. Other have had it removed by TSA. It is also wise to spray the enclosed spaces in which you eat, meet and sleep with an airborne insect spray (see below) about an hour before use, especially before going to bed. I spray around the windows and doors and any cracks which insects might crawl or fly through to get into the room. This is just one more tool in the battle against malaria. On earlier trips, I took a couple of cans of insect spray to use in the rooms in which our team members sleep and in outhouse toilets. With the change in security rules following September 11, 2001, such items are prohibited. Now, upon arrival, I purchase a couple of cans Doom® Insect Spray, which contains permethrin and pyrethrum. Please do not understand this recommendation to be such that you feel the need to walk around with a spray can in hand at all time. It is just one more tool in the line of defense against bugs in general but malaria carrying mosquitos specifically. Doom® is sold with three different labels. The can to the right is the blue label and is a broad spectrum spray that is effective against most insects in general. The gold label is specially targeted for and more effective against mosquitos and the black label ditto for roaches. Such sprays are rarely needed at Lookout Ridge but it very helpful to have in older, more rural guest houses in remote areas of Uganda. It never hurts to have a can handy in case of need. The blue label seems adequate. Almost all guest type facilities where you would spend the night will have mosquito nets. Therefore you really do not need to take you own. I always have a small roll of duct tape with me and if I find myself with a net that has holes in it, I can put a small piece of tape on each side of the hole to seal it up. Also, when sleeping under a net, you need to be careful that no part of your bare skin is against the net as mosquitoes can bite through the net in such cases.